Welcome to online book store of Boston Bilingual Media & Publishing Inc.! Get free shipping within the US on this must-read in Chinese American history. Dragon’s Teeth is a biography of WWII veteran Arthur Wong, a 92-year-old resident of Boston Chinatown. Arthur landed on Omaha Beach on D-Day 1944 as a US Army soldier, and was seriously injured during invasion into Germany in Nov. 1944. He received Purple Heart, Bronze Star and other medals 65 years after he returned from Europe. New book released — From Tsinghua to M.I.T. by Prof. Shih Ying Lee! 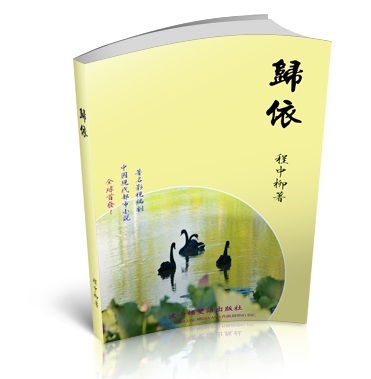 Please chick the Buy Now button below to order autobiography From Tsinghua to M.I.T.. For limited time, shipping within the US is free for this book when you buy for $16.88. Boston, Nov. 21, 2014, — The Chinese version of Late Glory: Authur Wong and Chinese American WWII Veterans Who Liberated Europe is in production now. Co-authored by David Li and Amy Yang, the biography is published by Boston Bilingual Media and Publishing Inc (BBMP). An English version of the biography will be ready for print in 2015 in time for the 70th anniversary of the end of WWII according to BBMP. Immigrated to Boston in 1938, Arthur Wong was among the first groups of American soldiers who landed on Omaha Beach on June 6, 1944, and was later seriously injured in November 1944 when the Allied Forces advanced into Germany. Sixty-five years after he returned from WWII battlegrounds, Arthur Wong finally received nine U.S. military medals, including Purple Heart, Bronze Star, with the help from Senator John Kerry in 2010. David Li and Amy Yang are senior reporters for Chinese newspapers and online media in the greater Boston area. This historical biography includes over 30 never published historical photos and first-hand interviews with WWII veteran Mr. Authur Wong whose very first battle was the famous Invasion of Normandy on D-Day. This books documents Mr. Wong’s early life in Boston after he immigrated in 1938 from Taishan, Guangdong, China, his army life, Battles of Normandy, liberation of Paris, invasion of Germany and many other major historic events. “It was my great honor working with Mr. Wong on this book. His indomitable character and optimistic spirit made himself a war hero in spite of the tough circumstances,” said Mr. Li. Boston Mayor Martin Walsh has graciously agreed a photo of Arthur Wong and him taken at the 2014 New England Wong Family Association Spring Banquet in Empire Garden to be used on the book cover. He thanked Arthur Wong for his sacrifice for the country and contributions to local communities after the war. The two authors have conducted over 40 interviews and meetings with Mr. Wong over past 18 months. This biography will provide fresh materials and distinctive perspectives for the historical research of Chinese Americans in WWII, and Chinese immigration during the Chinese Exclusion Act period from 1882 to 1943. Mr. Li hopes that this book will allow more Chinese people around the world to learn about such outstanding Chinese American veterans as Mr. Arthur Wong and their historical contributions to the victory of the Anti-Fascist war. The list price of the biography is $18.82($20 with MA sales tax). Free shipping is offered for online orders within the United States for orders placed on bostonese.com. 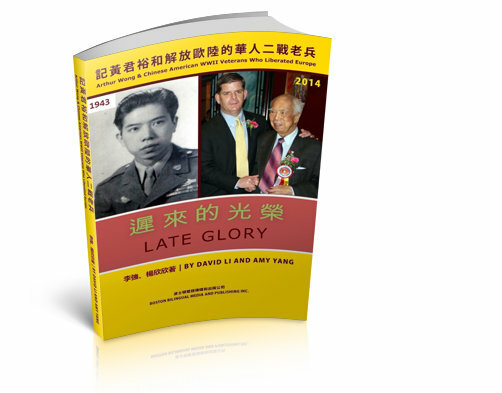 Please click the button below to order Late Glory, and own a piece of the glorious history of Chinese American WWII veterans! Great Books for this 2015! Welcome to our book store.